Some people consider themselves lovers of progress and new technology. They get excited over the announcement of the newest smartphone, version 43 zillion. They’re the first to try out that amazing computer watch with tiny buttons and a miniature screen that even the best reading glasses can’t conquer. I don’t happen to be one of them. But sometimes I still long for the good old days. For simpler things like chalkboards with real chalk. I miss useful things that have been collateral losses on the path to progress. Here is just one example. Remember this little baby? It is from the set of attached ties that used to come packaged inside a box of tall kitchen garbage bags. It happens to also be one of my favorite products in the world, something lost to progress, an increased focus on the environment or, perhaps, just cost-cutting. Handle-ties and drawstrings don’t do it for me. I get it. Really. There are probably millions of these little things taking up space in landfills at this moment. And I really don’t want to leave the planet in worse shape than when I arrived on it. But these things are really cool. I admit, though, when they regularly came in my trash bag boxes, I wasn’t sure what to do with them. Of course, I used them sometimes for their stated purposed of tying off trash bags. Other times, I just tied a knot at the top of my trash and stuck the leftover ties in a zipper bag in my laundry-room closet. Have I mentioned that I have trouble throwing things away sometimes? Then I discovered that these ties just might have other purposes. I started using them for everything. These magic little implements could be used to tie off the mess of cords behind my desktop computer. 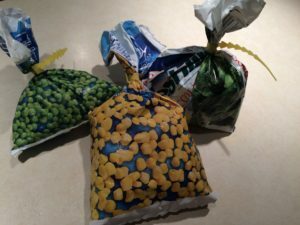 They helped keep my leftover frozen vegetables from spilling all over the freezer. 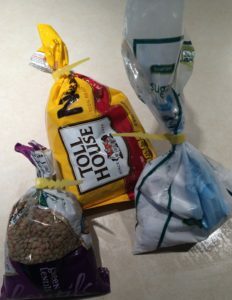 They closed off dried beans and powdered sugar and the bags of semi-sweet chocolate chips that my kids refused to leave alone. (You know who you are!) 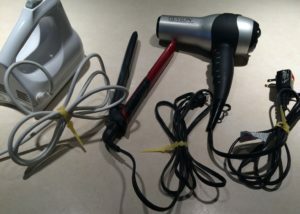 They also were great for tying off cords for all of my small appliances. Best of all, unlike some bag ties, they could be reopened and reused for a long time. So I kept replenishing my supply every time I bought a new box of trash bags. Suddenly, trash bags came only with handle-ties and drawstrings. I was sad. 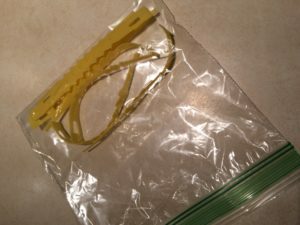 My little collection of yellow ties became a precious commodity, carefully returned to their zipper-bag home as soon as the sack of frozen peas was empty. I became all about the “3 R’s of the Environment” – reduce, reuse and recycle – at least when it came to one particular product. I hoarded them and handled them with care. But, unfortunately, even reusable products eventually wear out, and my stash has dwindled. I have realized that eventually I will run out completely, so I have considered putting out a plea to more successful hoarders, hoping they might consider sharing the wealth. As I have been writing this post, though, I have been doing doing online research, and I am happy to report that my favorite little ties still exist, after all. Hooray! Due to the growth of the Internet marketplace, I can buy a whole roll and be happily tying off things for years to come. So I must celebrate progress today. You really can find anything on the Internet. I promise to use my ties wisely and only send them to the landfill after they have been well loved. So tell me, do you have any special products that you love and have lost, at least temporarily, to progress? Please share some of the interesting uses you have found for them. Now you’ll have to forgive me for cutting off this post so abruptly. I have some shopping to do.